So I was going to update another post this week to replace a not-so-pretty photo, then I decided to write a whole new post instead! I’ve posted shrimp scampi before, but instead of updating the other post with new photos, I created a new one to serve with pasta (the other is meant to be a paleo-ish post). Though I’d still like to update the original one with prettier photos, I’d also like to update the recipe itself because I want to tinker with the ingredients for the paleo version. Maybe I will work on that soon! In the meantime, here’s one of my favorite (and super easy) pasta dishes. 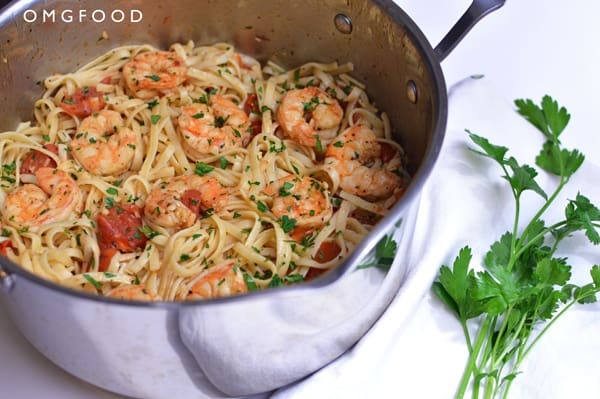 Shrimp scampi with linguine! When it comes to cooking fats, you may know by now I use various types of olive oil depending on the recipe. Extra virgin is mostly for dressings, regular olive oil for sauteing and marinading, and extra light for frying and of course, homemade mayo. There are very few recipes I cook with extra virgin olive oil, but this is one of them! However, extra virgin can burn really easily, so I always cook at a low or low-medium heat. It takes longer for the pan to heat up, but waiting is way better than ruining the oil. Once it burns, it is useless, and that’s bad news bears! Olive oil is expensive; the last thing you’d want to do is waste it!